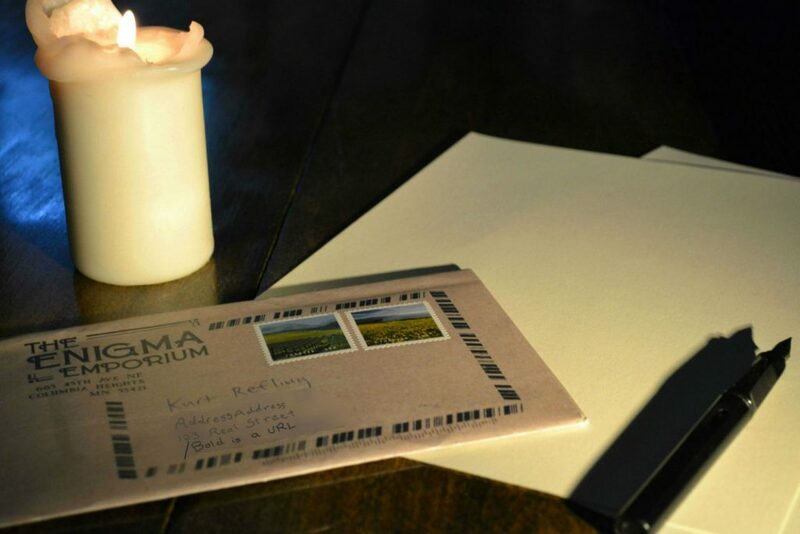 The premise is as intriguing as any good Agatha Christie hook: a simple envelope arrives in your mailbox. Inside are five unassuming postcards with no return address. That’s strange — the mailman has already passed by today. Reading closer, you realize that these postcards have been sent to you by a brilliant criminal. He offers you, an ace detective, the chance to stop him before his next crime… well. That, and a hell of a lot of puzzles. 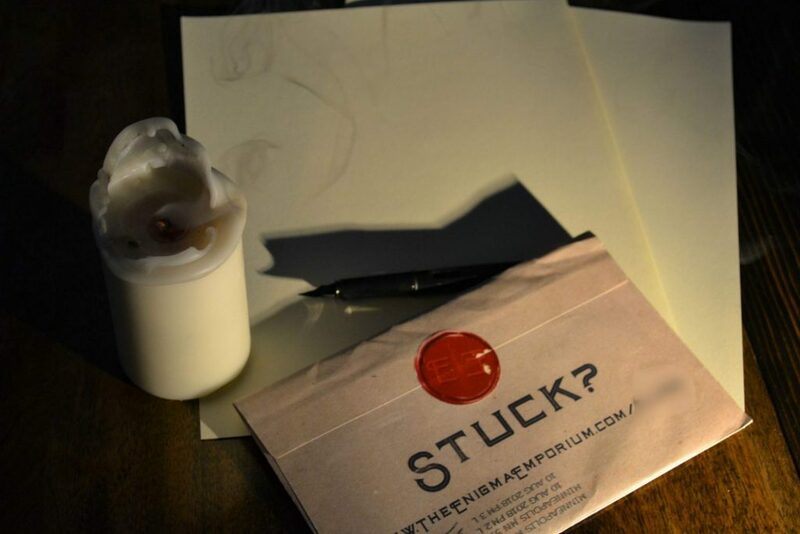 Enigma Emporium is a new publisher devoted to “narrative puzzles”. These five postcards are the entirety of their first mystery experience, Wish You Were Here. Unlike the game, I won’t keep you guessing: Wish You Were Here is fantastic. To most of you reading this, the idea of a puzzle game is probably familiar. From Unlock! 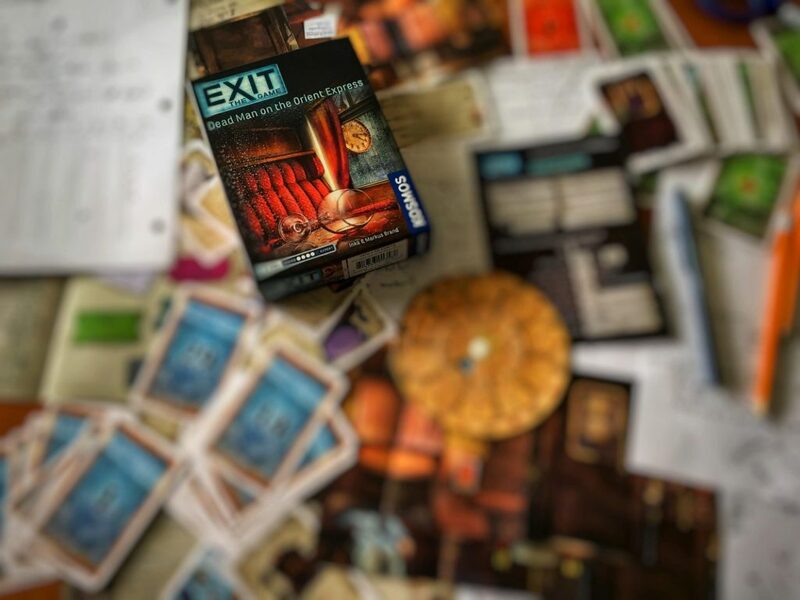 : Escape Adventures to the award-winning Exit series, there’s a thriving young market for games that throw you into a room full of riddles. Many of these games take their inspiration from escape rooms: real-life businesses where you and your friends are asked to find clues and solve puzzles to escape before time runs out. All of these experiences share some common threads with Wish You Were Here. One of Wish You Were Here’s contemporaries, Exit: The Game. Second, most of these games can be played alone or with friends. There’s no player count provided for Wish You Were Here, but I found we had a really good experience with three people. Lastly, like its predecessors, Wish You Were Here is full of clever clues and ciphered riddles that direct you, however subtly, to a certain code-cracking solution. The difference is that Wish You Were Here doesn’t hold your hand. And that’s part of what makes it great. In the world of escape room games, the process is often pretty linear. You may have some branching pathways, but things tend to boil down to this clue leading to that clue, with a little of this puzzle on the side. Wish You Were Here throws this formula out the window. All game materials are available right at the start. There are no instructions, guidelines, or directions outside of what the criminal has written for you. In this game, I was told I was a detective, and I’ll be damned if I didn’t feel like one! There was no cute riddle system to push us through a bunch of puzzles. We were on our own. This was what we loved about the game. Every time we started unravelling a puzzle, we felt a kind of rush. To solve the puzzles, we had to find them first. Most clues were very subtle; there were no key cards with matching locks. We actually had to crack the code. In some ways, it makes you feel like a crazy person, pulling strings across a map and gesturing wildly… but then when you get it — when it finally clicks? Boy, it feels good. See, Wish You Were Here makes one key assumption: you’re smart. And not just that– you’re a smart person living in 2018, which means you have access to the infinite resources that the Internet has to offer. Googling something to solve an Exit mystery would be considered by many to be cheating. In Wish You Were Here, it’s expected. To showcase how differently Enigma Emporium is operating, I’ll contrast what they do with an example from one of my past escape room games. It was several months ago, playing a more conventional escape puzzle. After solving a clue, we unlocked a new riddle: dots and dashes printed clearly on a card. Well obviously this is morse code, right? We pulled out our smartphones and looked up a key. The answer we got… didn’t make any narrative sense. It seemed to assume we had found something that hadn’t happened yet. What went wrong? In this escape game– which will go unnamed– they expected we would wait until we found the Morse code decoder key… which wouldn’t be uncovered until a few puzzles later. I remember thinking, Why do I have to wait for them to spoon feed me the key to a lock I already know how to open? So Wish You Were Here doesn’t mess around. It gives you all the puzzles right up-front. This is another great perk to the system: it never felt like we had nothing to do. All five postcards are densely packed (I mean it!) with puzzles, over and on top of each other. Tired of working on one? Pass it to a friend and take a look at whatever has them stumped. There is no timer in Enigma Emporium’s mystery, so the pressure to deduce is coming straight from your own natural curiosity. That said, this lack of direction is also perhaps the game’s one flaw: we weren’t always totally sure what we were looking for. 95% of the time this worked to the game’s advantage, but I think it would have benefited from a couple of small distinctions about the big picture. Even so, the game is never cruel. If your team of detectives reaches the end of their rope, there’s a helping hand to be found on Enigma Emporium’s website. We’re just two lost souls swimming in a fish bowl. The website has a series of tiered clues for each puzzle. This, too, was done exceptionally well: clues never felt useless, but were also staggered cleverly in a way that gave us something new to chew on before actually coughing up the answer. All told, I would say we got 70% of the answers with no help and the other 30% with a subtle hint. Maybe you’ll get those last few better than we did, but I’ll say it again: some of these puzzles are devious. Enigma Emporium’s Wish You Were Here is a dense, carefully-crafted puzzle. It offers a chance to be clever– not just to feel clever, but to really wrack your brain for creative solutions. It can be played all at once, or over several days on and off… I might recommend the latter, because it’s at least three hours of solid thinking. At the end of the case, we felt proud and exhausted after cracking a very clever little code. A code much like the secret message hidden in this review. Or did you miss it? The Enigma Emporium Presents: Wish You Were Here is now available on Kickstarter. A free copy of the game was provided for review purposes, but my thoughts are my own. Next postLovelace & Babbage – Why Didn’t the Integer Get Airplay?